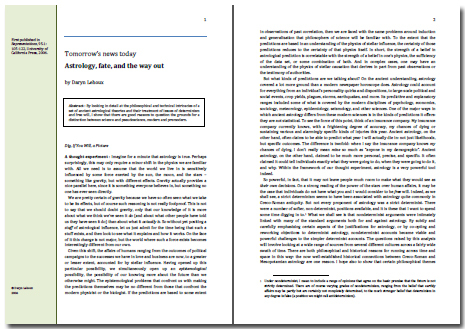 By looking in detail at the philosophical and technical intricacies of a set of ancient astrological theories and their treatment of issues of determinism and free will, Daryn Lehoux shows that there are good reasons to question the grounds for a distinction between science and pseudoscience, modern and premodern. 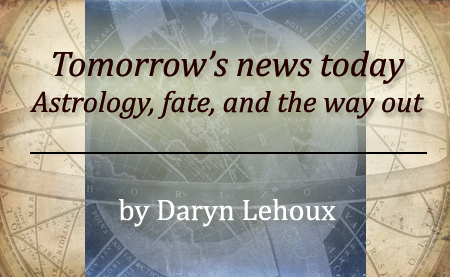 Daryn Lehoux is Professor of Classics at Queen's University, Canada. His research fields cover the ancient sciences, astronomy, astrology and astrometeorology. He is the author of Astronomy, Weather, and Calendars in the Ancient World: Parapegmata and Related Texts in Classical and Near-Eastern Societies (Cambridge, Cambridge University Press, 2007) and the soon to be published What Did the Romans Know? (Chicago, University of Chicago Press, expected 2012 - currently available on pre-order at £28.53 + P&P). The article made available for download is copyrighted to Daryn Lehoux and is offered here for private and non-commercial use only. It may not be reproduced further without his specific agreement. Published online November 2011. 95.1: 105-122, University of California Press, 2006.